Francesca Caccini was born into a musical family in Florence at the time of the birth of opera, and was perhaps the most prolific and successful woman composer of her time. Although almost everything she wrote was for voice, we will be playing an instrumental Ciaccona by her at our Notes for Women concert at St George’s on 28 April. Click here for concert details. She was born in 1587 to the singer Lucia Gagnolanti and the respected composer Giulio Caccini, who was a pioneer in the new musical form of opera. 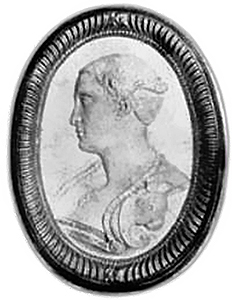 Lucia died when Francesca was very young, and Giulio then married another singer, Margherita della Scala. In 1600, 13-year-old Francesca, her younger sister Settimia and her stepmother took part in the first public performance of an opera – Jacopo Peri’s L’Euridice – which also included musical contributions by her father. 25 years later, Francesca would become the first woman to write an opera – La liberazione di Ruggiero dall’isola d’Alcina [The liberation of Ruggiero from the Island of Alcina]. The sisters’ musical training began early at the hands of their father, and Francesca played the keyboard, lute, guitar, and harp, as well as singing. Both sisters were trained in composition. Francesca was also well versed in literature, and became known as a poet as well as a singer – she probably wrote the lyrics for many of her own songs. When Guilio Caccini was commissioned to write the music for the wedding of Henri IV of France to Maria de’ Medici, young Francesca performed it, and so began a long association with the Medici family. In 1605, after the Caccinis were invited to visit the French court in Paris, Henri IV offered Francesca a job as a singer, but Grand Duke Ferdinand refused permission for her to leave Florence, and soon after, aged 20, she was officially employed by the Medici court. Within seven years she had become the court’s highest paid musician. The year she joined the Medici court, Francesca got married to another court singer, Giovanni Battista Signorini. Their only child, Margherita, was born 15 years later. During this period, Francesca served the Medici as a singer, teacher and composer, writing some or all of the music for at least 16 staged court entertainments, including her one surviving opera. In 1618 she published a collection of 36 solo songs and duets in Il primo libro delle musiche [The first book of music (although there does not appear to have been a second)], one of the largest and most varied song collections of the period to survive. It is a compendium of contemporary styles, ranging from moving, harmonically adventurous laments to joyful sacred songs in Italian and Latin, and witty songs about the joys and perils of romantic love. It was perhaps intended as a pegagogical collection for her students. There are a couple of rather nice portraits that are often claimed to be of Caccini (readily found on the internet), although there is no evidence to support this. This article discusses one of these – Orazio Gentileschi’s The Lute Player – and Wikipedia’s role in the mis-identification of Caccini. Her husband Giovanni died in 1626, but within a year Francesca had remarried – to the aristocrat Tomaso Rafaelli – and in 1628, aged 41, she gave birth to a son, also called Tomaso. Two years later, her new husband was also dead, leaving Francesca a wealthy woman. In the 1630s she continued working, on and off, for the Medicis, and finally left their service in 1641, aged 53. What happened next is unclear, as she disappears from the historical record. We know that in 1645, guardianship of Tomaso (by then aged 17) passed to his uncle, which might indicate that Francesca had died or remarried. Caccini was highly educated and was described as ‘always gracious and generous’ and as a woman of rare wit. She is thought to have been a quick and prolific composer. Her works show a strong sense of structure, and unusually detailed notation to capture the rhythms of Italian speech and the fleeting emotional shifts of her texts. She was a master of dramatic harmonic surprise, and uses it to powerful effect. Francesca Caccini’s abilities as a singer, teacher and composer were remarkable, and she was born at a time and place where she was able to make the most of her talents – helped by being one of the favourites of Europe’s most powerful family. It is tragic that we know that she composed a great deal, yet so little of her music survives. Even on the basis of the small proportion that we have, Francesca Caccini must surely be among the greatest female composers of all time.